Is to provide opportunities for young men to have a fun, challenging, supportive and exciting Scouting experience. Active, enthusiastic scouts supported by involved and supportive parents in an outdoor based boy run program that holds the scouts interest. We encourage the scouts to advance in rank so they have the skills to enjoy the opportunities presented, but not at the expense of fun. Regular Troop meetings for Scouts occur on the 2nd and 4th Friday evenings of each month from 7:00 PM to 8:30 PM. Meetings are held at St. Joseph Marello Catholic Church, 7200 Folsom-Auburn Rd., Granite Bay in the class rooms at the rear of the church. (Note: The 4th Friday meeting will focus on advancement skills, but Scouts should bring their handbook to every meeting). Committee meetings occur on the second Monday of each month at St. Joseph Marello Catholic Church in Granite Bay from 7:00 pm until 8:30 pm. Scout Shirt w/Patches. Neckerchief is provided by the troop (White/Yellow) & Slide Rank Patches. Some extra uniforms pieces may be available from the troop. Uniform worn by all scouts, Scoutmaster, ASM’s and Committee Members during scouting events. Please see the Uniform Requirements section for more details. These forms must be submitted to the Scoutmaster annually before Summer Camp. Parts A and B are required annually for all adults and scouts. Both parts are required for all events that do not exceed 72 consecutive hours. Part C is required with Parts A and B for any event that exceeds 72 consecutive hours or when the nature of the activity is strenuous and demanding. This includes Summer Camp. This part requires a Physician’s signature. This is the heart and soul of Troop 115. The patrol method gives Scouts an experience in group living and participating citizenship. It places a certain amount of responsibility on young shoulders and teaches boys how to accept it. The patrol method allows Scouts to act in small groups where they can easily relate to each other. These small groups determine Troop activities through their elected representatives. After boys cross over to Boy Scouts, the emphasis changes from an adult run program to a boy led, adult supervised program. This transition is often harder on the adult leaders and parents than for the Scouts. The adult leaders and parents are there to guide the boys and help them develop a sense of independence and leadership skills. A good rule of thumb is to never do what a boy can do for himself. If he can’t do it, then teach him so he can do it next time. Full year program – Camping approximately 8 times a year, Community Service, Fundraising events, and one-day outings. Summer Camp for one week in June/July/August. National Jamboree at the Summit (West Virginia), Philmont (New Mexico), Northern Tier (Minnesota), Florida Sea Base, World Jamborees. Opportunities to serve as counselors at summer camps and attend leader training provided by Troop 115 and the National Youth Leadership Training (NYLT) at council level. Camperships are available from the Golden Empire Council for summer camp. Scholarships may be available from the Troop for Scouts to attend National Youth Leadership Training (NYLT). A parent should contact either the Scoutmaster or the Committee Chairperson to discuss opportunities for these scholarships. Scholarships may also be available for our Adult Leaders to attend Woodbadge. Personal Scout gear includes (but not limited to) hiking boots, rain gear, sleeping bag, sleeping pad, mess kit, canteen or water bottle, and gear storage. See Gear Guide section for more details. There is at least one fundraising effort for the Troop each year (Popcorn Sales); however depending on the needs of the troop, additional fundraising activities are conducted. . Scouts and parents are expected to participate as much as possible. The monetary success of the Troop is directly related to the effort that is made by the Scouts. Prior to each of the fundraising efforts, the Troop Committee will set the criteria for the portion of the funds obtained by each Scout that will go to a dedicated account in the Scout’s name. This money can then be used for summer camp, purchasing uniform pieces, and other activities related to scouting. The Troop supports our Council by participating in the annual Popcorn sales that are held in the fall. A portion of the proceeds goes into individual Scout accounts to assist in paying for Scout expenses as they or their family chooses. Upon joining Troop 115, a Scout account is created in our financial tracking program. Each scout can earn money from our fundraising activities. This money can be used for any activity directly related to Scouting (i.e. summer camp, uniform parts, etc.). Each event has its own calculation for the amount that can be earned. Contact the Troop Committee Treasurer any time to find the balance of your scout account. Each scout must pay the cost of summer camp in advance. The cost of one week at an in-council camp is approximately $325. A down payment is required in the spring for registration and a deposit is required from the Troop to hold a campsite. The Scout can use the money that has accumulated in his Scout account during the year to offset the cost of summer camp if he wishes. 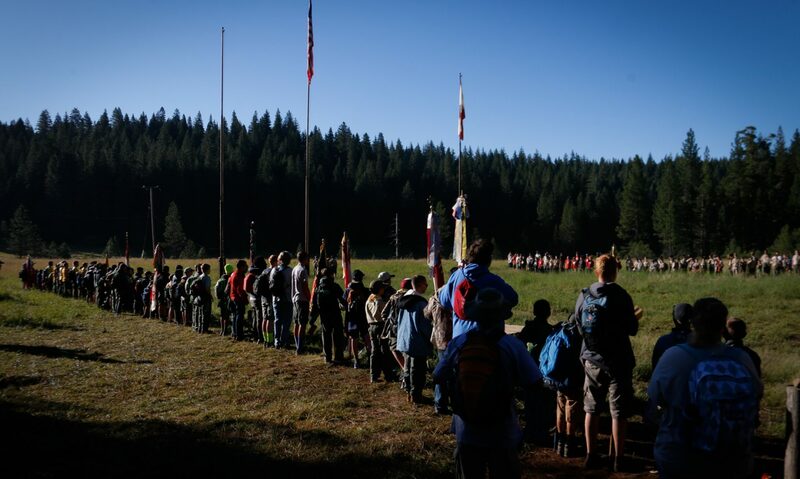 Troop 115 regularly attends the Golden Empire Council Camp Winton or Camp Lassen. Occasionally the Troop may attend out-of-Council camps. It is a good idea for your Scout to start and maintain a memory book of his Scout experiences. He will need to retain the achievement cards which are awarded as he progresses through advancement from Scout to Eagle. He will also receive achievement cards confirming the award of his merit badges. These cards fit nicely into 3-ring binders in “baseball card” inserts. Adding photos, old uniform rank patches, event patches and other memorabilia makes for a nice record of his trail to Eagle. Your scout should bring his Boy Scout Handbook to every meeting and Scout outing as this book serves as his advancement record. He records outings and service projects in the Handbook as well.